The Encounter at the Barbican. Photo: Robbie Jack. The first time I see The Encounter is in April 2015. I am 19 years old and I’ve just moved to Berlin for three months. I’m a little lonely. My father visits me on my second weekend there and he suggests we see some theatre together. On Google, I find a theatre called the Schaubuene, which is running a festival called FIND 2015. I don’t recognise any of the names except one. 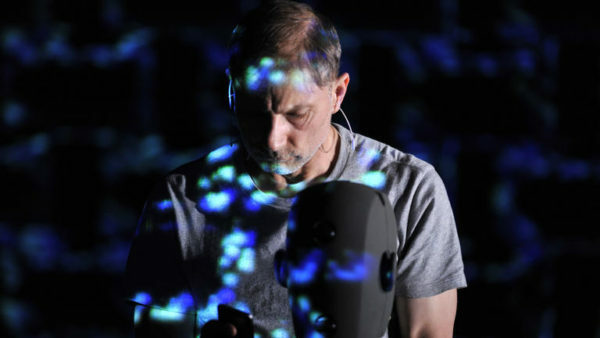 Simon McBurney is sharing part of a new show he’s working on. It’s called Amazon Beaming. I don’t know much about him, but I like Complicite. Tickets are 5 euros each. I book two. I can’t quite express how much this show means to me. Strip away the noise and the fury and the looping pedals and the binaural head and the foley and that massive, swooping Barbican stage, and at its core is this quiet man, gently but firmly telling his daughter what it means to be human. I find it difficult to write about this show – words, ironically, end up feeling too tiny and inconsequential to contain the well of emotion. I’ll use someone else’s. There’s a quote from Toni Morrison’s Beloved – “They stopped praying and took a step back to the beginning. In the beginning there were no words. In the beginning was the sound, and they all knew what that sound sounded like.” It’s this evocation of community power, and language being non-verbal as well as verbal and the sort-of kind-of magic that comes with being in a group of people all looking at the same thing, all bearing witness at the same time. I partly love this show because it makes me feel clever. It’s really unapologetically dense, but not in a way that makes you feel like you’re too dumb for it. Because we all think about time, and memory, and how our minds formulate stories, right? In a practical, feasible sense, at least, if not in the massive hypothetical sense. We think about how long it’s been since we saw our grandma, how many grey hairs she’s grown in the last six months. We embellish stories that we tell our friends down at the pub to make them just that little bit more entertaining. These things are woven into everyday life – Simon’s just the cool teacher who makes you realise that all this big stuff is relevant to You Right Now, Kid. He uses the Big Words, but places them contextually in sentences so that you infer the meaning without having to actively ask for it. I’ve been trying to figure out a non-wanky way to say “I think the show helps me remember what is good and wonderful about theatre but also about humans,” but I’m not quite there yet. That has to be the reason I’ve seen it five times. It’s that – human – aspect. I was sitting in the Barbican, alone in row K and when Simon asked the audience to close their eyes at the beginning of the show I could feel these electric threads running through the theatre, running out from the centre of my body to the very front row, where my almost 80-year-old father was sitting (3 years after we saw that scratch together in Berlin! How has it been 3 years already? ), and then I could feel the electric strand fizzing and spitting and reaching out to the other side of the theatre, where my boyfriend was sitting (we saw the show at Warwick Arts Centre on the same night in our first year of uni, two years ago, except we didn’t know each other at the time. How has it been two years already?) And that thread circles out and what connects us all is Simon, standing in the middle of that enormous stage, telling us that some of us are friends. I’m not sure if I’ve totally cracked it. I think it’s probably a show that thrives in the liveness of conversation, in the pregnant pauses as much as the actual words. Maybe a podcast conversation would be better suited to talking about it. Reading initial reviews of the show, I felt like there was something fundamentally missing, something that the critics just weren’t Getting, despite the enormous praise. I think that missing Thing lies in conversation. I don’t think the written word can hold The Encounter. The Encounter is on until 5 May 2018 at the Barbican. Click here for more details.